The Gaurs were ruthless as they controlled the game throughout. 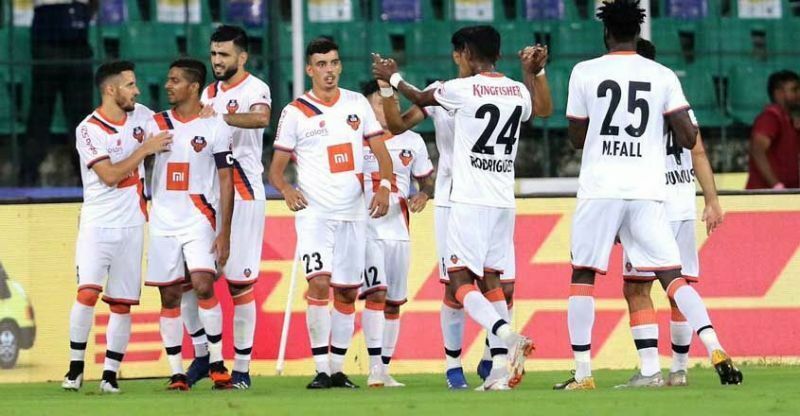 Bhubhaneswar: FC Goa defeated Chennai City FC by 3-0 in a semi-final fixture played at the Kalinga Stadium here on Tuesday to qualify to final of the Super Cup 2019. With Edu Bedia out with a suspension, Hugo Boumous was brought back into the FC Goa starting eleven by head coach Sergio Lobera. Chennai City head coach Akbar Nawas, on the other hand, made two changes to the side which started the quarter-final tie against Bengaluru FC. Charles Lourdusamy came in for the suspended Michael Regin in midfield, while Alexander Romario Jesuraj was brought in place of Ameerudeen Haja. FC Goa caused troubles from early minutes of the game with Jackichand Singh finding space down the right wing and threatening the defence with his quick feet and unpredictable runs inside the box. The Gaurs came out with a positive mindset and their quick silky passing pushed Chennai back, barely giving the newly crowned I-League champions a sniff of the ball. Seriton Fernandes and Zaid Krouch came close to scoring in the first 15 minutes of the game. The former's shot at goal was deflected wide while Krouch's deflected shot from range demanded a fingertip save from Chennai City custodian Mauro Boerchio to stay out. The Gaurs kept on relentlessly attacking and their dominance finally paid off on the 25th minute as Jacki found Ferran Corominas in the box. With the Spaniard's back turned towards the goal, it seemed the Chennai backline had enough time to position themselves to cut off the angles. However, Charles couldn't time his run and clattered into Coro, leaving the referee with no choice but to point towards the spot. Boerchio had Sunil Chhetri from the penalty spot in their last match, but no one seemed to have told Coro that, who calmly executed an audacious Panenka to beat the Italian. The first half ended with the Gaurs holding a well-deserved two-goal advantage. Chennai City began the second half on the front foot and threw numbers forward in search of a way back into the game. However, the Gaurs backline held strong to deny the Hero I-league side any room in the attacking third. Chennai’s attacking approach also opened up the game, leaving plenty of space at the back for Goa to exploit on the counter. One of these almost ended in Goa and Coro’s third goal of the night. Jacki bombed down the right flank before playing in a searching ball for Coro on the box. The Spaniard even managed to reach the ball on full stretch but couldn’t keep his effort on target. As expected from a team trailing by three-goals in a knockout tie, Chennai tried to throw the kitchen sink at Goa for the final 20 minutes plus added time, but did very little to worry the Goa defence. In fact, the gaping gaps in the Chennai defence allowed the Gaurs to break forward almost at will. Sergio Lobera’s men created ample opportunities to make the scoreline far more imposing, but a bit of bad luck, some last-ditch defending and a few terrific saves from Boerchio helped Chennai avoid any further blushes. The match ended 3-0 in Goa’s favour.